Currently, Taiwan has two MRT systems up and running (Taipei and Kaohsiung) with a third (Taoyuan) slated to open next year (2015). Taichung recently opened a cheaper alternative to the MRT known as BRT (Bus Rapid Transit), although its own MRT system is also scheduled to open in the coming years. MRT expansion plans are well underway across the island, with new lines opening every year. Route map as of early 2014. Click for huge map. The Taipei MRT is expanding rapidly. 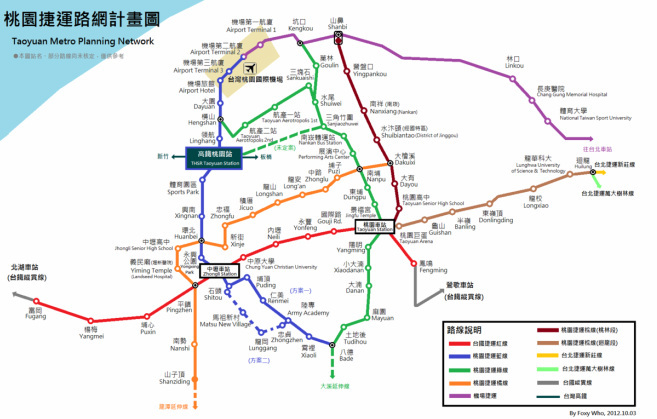 The airport line (purple) and Nanjing line (green extension) will open in 2015, with the circular line (yellow) and Shulin line (light green) following soon after. In the future, light rails will connect local areas that are too small to warrant a full capacity MRT such as Tienmu. Check out this long-term plan (Chinese) for the full details. The next phase of the Kaohsiung MRT includes a street-level light rail circular line (green), and re-purposing of some existing rail lines for MRT use (blue). Check the future expansion map from Wikipedia. 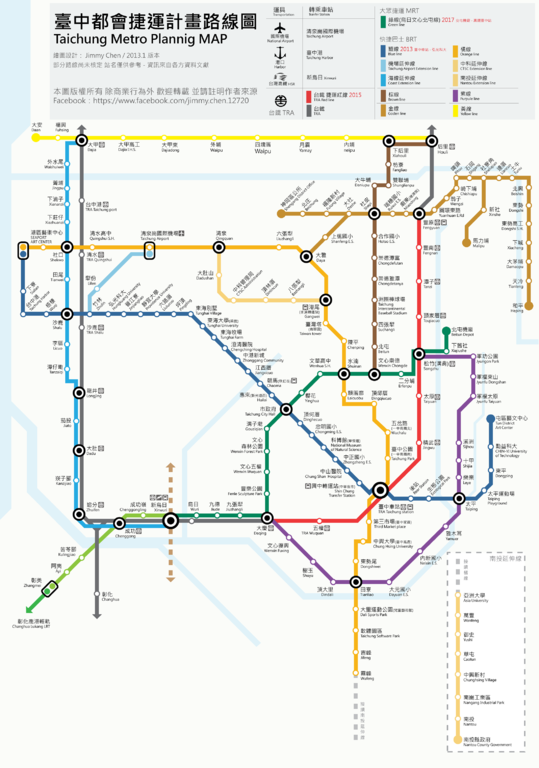 The Taoyuan MRT is under construction (2014) and the first two lines (one of which is the airport line from Taipei) are slated to open in 2015. The second phase of those lines, in addition to the third line, will be opened by 2018. While stations locations are not yet finalized, check out the map for an idea of what we can expect in a few years time. 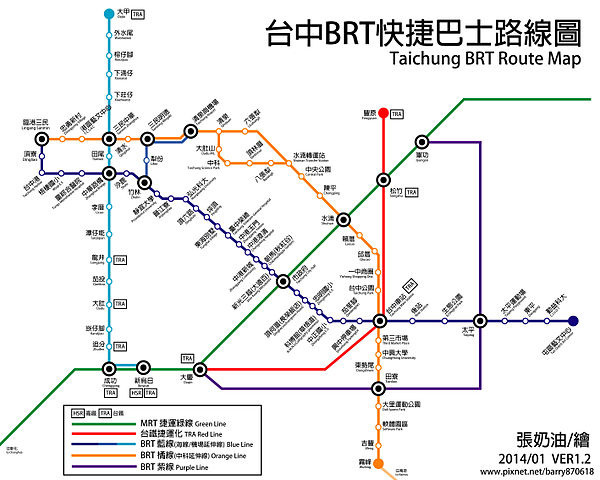 Taoyuan MRT planned lines, not yet confirmed. Click to enlarge. The first BRT line (blue) partially opened in July, 2014, and will be phased in over a few months. Two MRT lines are currently under construction. Click the maps for bigger versions.